Salix have been delighted to be involved with the inspirational Down to Earth Project creating a green roof, on Gower near Swansea. We have been supporting the group in their green building work particularly at their building at Little Bryn Gwyn, a project focussing on disaffected young people. The project includes teaching young people green building skills, giving them back a sense of self-reliance as well as a useful trade. A new building required a green roof which had a steep (43°) pitch, making it very challenging. 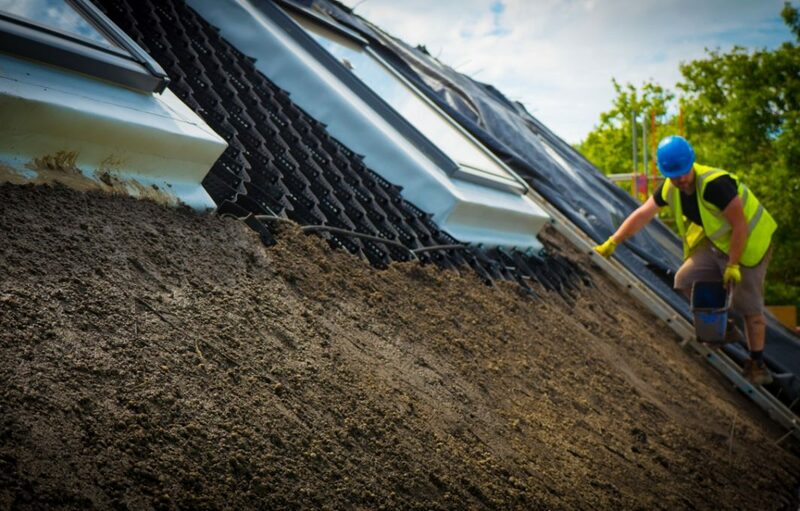 However our understanding of soil erosion techniques using HydraCX and soil cells (both supplied and installed by Salix) made easy work of the steep roof. HydraCX is a system which hydraulically applies seed using a mix of natural tackifiers and soil amendments. A mix of native seeds were incorporated into the HydraCX and sprayed onto geotextile cells filled with soil. The roof rapidly greened up and provided a stunning floral display in the first year. Green roofs are a fantastic way to reduce surface water runoff from buildings, whilst providing localised cooling and a superb habitat for wildlife.